My first job after completing high school was working in an old cellar in the Barossa Valley filling and stacking port barrels with an “Old Codger” (old man). Each day the two of us would finish work with a glass of port and share a few stories. What a civilised way to finish the day! Over the years we have put together a Solera of old fortified wines. It is from this Solera that we have prepared the blend of tawny port that we call “Old Codger”. 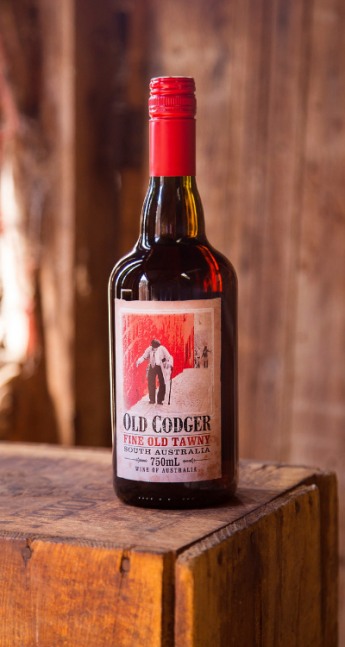 “Old Codger Fine Old Tawny” is a blend of many fortified wines from barrels that have been collecting dust in our shed for many years. It shows great complexity and has much rancio butterscotch like flavours, a result of blending the older fortifieds with the younger fresher components. Blending using a Solera system gives consistency to the style and quality from year to year. A wonderful combination of flavours, best consumed anytime with good friends. We trust you’ll enjoy it! Oak Maturation: An average of 6 years in old oak hogsheads and smaller oak barrels. An eclectic blend of Verdehlo, Semillon, Muscat Petite Grain, Chardonnay, Shiraz, Grenache, Touriga and Pedro Ximenez, (as Wayne says, “almost anything that grows on grapevine”) the NV Old Codger Tawny is a “Tawny Port” style produced using a Solera system in small oak barrels with an average wine age of 6 years. Pale amber / tawny in color, it offers aromas of dried red berries, dates and sultanas with a faint honey-nut undercurrent. Very sweet and concentrated, it gives mouth-filling nut and dried fruit flavors with refreshing acid to balance and a very long finish. Drink it now.